Unveiled at the 2013 North American International Auto Show in Detroit, it wasn’t long before the Lincoln MKC hit showrooms nationwide. Now in its third model year with the 2017 edition, the MKC is vying for attention in the compact luxury crossover SUV market with its emphasis on comfortability and abundance of tech features. Four trims are available on the MKC: the Premiere, the Select, the Reserve, and the Black Label. Weighing nearly 4,000 lbs, the Lincoln MKC has a bulkier yet more streamlined profile than the average compact crossover. Crisp lines, low roof, and high beltline combine to give off an athletic stance. At the front, the angled HID headlights, which have automatic delay-off ability, flow seamlessly with the split-winged grille, with slimmed fog lights nestled beneath them both. Flanking them are power side mirrors with heating capability; integrated turn-signal indicators appear once you upgrade to the Select trim. The upper-level Reserve and Black Label trims feature a power moonroof on top for letting the breeze in during the hotter months. At the back, the full-width taillights are accompanied by a spoiler above it and a dual exhaust below it. All trims ride on alloy wheels: 19-inch ones on the top-level Black Label, and 18-inch ones on the other trims. The wheels sit inside wells that are felted to help soften road noise. Powering this crossover vehicle from Ford’s luxury division is a turbocharged 2.0-liter EcoBoost inline 4-cylinder engine (I4), which the choice between front-wheel (FWD) and all-wheel (AWD) drivetrains. Producing 240 horsepower at 5,500 RPM and 270 lb-ft of torque at 3,000 RPM, the 2.0-liter I4 provides enough power for acceleration, while minimizing gas guzzling as much as possible; its peak fuel economy is measured at 21/28 mpg. For more power, however, you can opt for the available turbocharged 2.3-liter EcoBoost I4, which has an output of 285 horsepower at 5,500 RPM and 305 lb-ft of torque at 2,750 RPM, while producing a reduced peak fuel economy of 19/25 mpg. This option is available on the Select trim and above, and it can only be paired with AWD, which supplies enhanced traction. Each engine is hitched to a 6-speed SelectShift® automatic transmission, named so because it permits increased control over gear shifting—similar to a manual transmission. 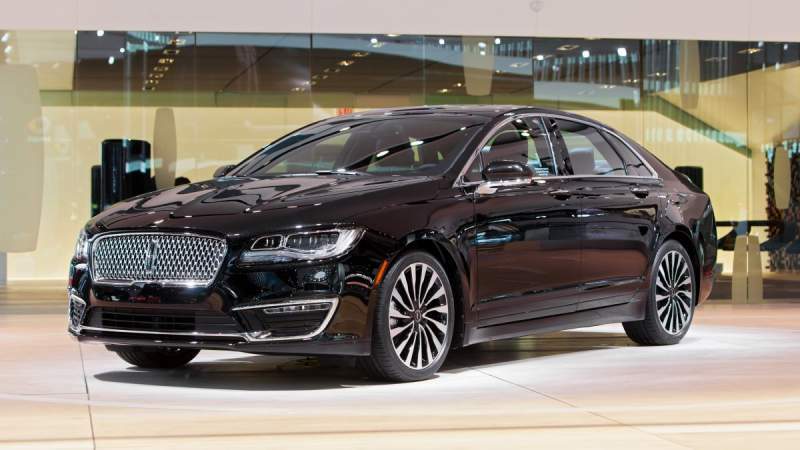 Fortified with stabilizer bars and bearing gas-pressurized shocks, the all-wheel independent suspension on the Lincoln MKZ consists of a MacPherson strut design at the front with a stabilizer bar, and a multi-link design at the back. This enables the crossover to effectively absorb the turbulence caused by rougher terrain. The electric power-assisted steering ensure precise cornering. And the all-wheel anti-lock power disc brakes keep stopping distances short and prevent the wheels from locking up when they are applied. You can even choose to enhance the suspension’s absorbing ability with a computer-controlled option called Continuously Controlled Damping, or CCD. Designed as a five-seater, the Lincoln MKC provides a passenger volume of 97.9 cubic feet: more than enough for adult occupants at full capacity. The vehicle also yields up to 53.1 cubic feet of cargo room, provided that you fold down the rear seats. Multi-way power adjustability and heating capability on the front seats—including a memory positioning system for the driver’s seat in particular—are standard. Leather upholstery and genuine wood trim (from Scotland!) are extended to trims above the base-level Premiere. Cooling capability on the front seats are added on the Reserve and Black Label. Keeping everything peaceful in the cabin is Active Noise Control, which reduces unwanted noise while enhancing desired sound with a system that incorporates a microphone and a signal processor. For infotainment, the Lincoln MKC comes with the voice-activated SYNC 3 communications system. Accompanied by a huge color touchscreen for displaying audio and phone information, SYNC 3 enables you to control the 10-speaker stereo system with your smartphone via Apple CarPlay and Android Auto. For an enhanced entertainment experience, you can go with the optional 700-watt THX® II Certified Audio System, which has 14 speakers strategically placed throughout the cabin. Also, if you go with the Reserve or Black Label trim, you also get a navigation system, which includes a six-year prepaid SiriusXM Traffic and Travel link trial subscription for providing detailed information on traffic, weather, and points of interest like gas stations, restaurants, and movie theaters. Also on the Lincoln MKC are a power liftgate for hands-free opening of the trunk, keyless entry with push-button engine start, controls mounted on the steering wheel, and a universal transceiver for remote-controlling your garage doors if you go with the Select trim or higher. To keep every occupant in the vehicle safe in the event of a collision, the Lincoln MKC comes with dual front impact airbags and knee airbags facing the driver and front passenger, a pair of side impact airbags installed on the front seats, and two front and two rear side curtain airbags installed on the roof. Other standard safety features include electronic stability control to keep you in command over slippery surfaces, a rearview camera for flashing a video image of the rear when moving in reverse, roll stability control to compact the possibility of the vehicle rolling over, and brake assist to apply more stopping pressure when needed. Available on the MKC is Active Park Assist, an ultrasonic sensor-based system that accompanies the rearview camera in promoting more accurate parallel barking. Also available is Approach Detection, a function that lights up the exterior when the MKC senses your presence up to eight feet away. If you treasure a quiet, comfortable ride, the Lincoln MKC is an ideal choice. Virtually no entry in its class can compete with it in this area. Credit is due to a cabin that is heavily insulated, as well as the felted wheel wells and even the way the side mirrors are positioned on the doors. U.S. News & World Report, which ranks new vehicles based on an evaluation of aggregated automotive review data, places it among the top 10 luxury compact SUVs. It also comes with loads of amenities and advanced technologies that dwarf most of its competitors, which include the BMW X3 and the Volvo XC90. However, the Lincoln MKC does not shine as brightly when it comes to rear seating space and the cargo area. It can feel cramped compared to many of its competitors. And while it is an expert in providing vehicular insulation, the MKC is not exactly the first crossover SUV to turn to in terms of engine power and driving excitement. These shortcomings prevent it from truly being in the upper echelon of compact crossover SUVs. The new Lincoln MKC has a starting MSRP of $32,880 with the Premiere, $35,880 with the Select, $39,645 with the Reserve, and $45,635 with the Black Label.